Cure the sickly warlord Roderick at Fort Sutch: a spoonful of sugar, a pint of poison. Receive the contract from Ocheeva and the new "medicine". Travel to Fort Sutch and make your way to Roderick. (Optional) Remain undetected during the infiltration. Switch the medicine with the poison in the cupboard. Head back to the Cheydinhal Sanctuary to receive your reward. Speak with Ocheeva to complete the "Enter the Eliminator" mini-quest and receive your next contract. She asks you to kill the ailing warlord Roderick at Fort Sutch and gives you a bottle of poisoned medicine. Only by sneaking into the fort and replacing his medicine bottle with the poisoned one, while remaining completely undetected, will you receive a bonus. The guards never sleep, so there is no best time to do the quest. Additionally, since Roderick, his four guards, and the medicine cabinet only appear after the quest starts, you cannot kill them beforehand. Finally, one-hit kills will not cause you to forfeit your bonus as long as you were not detected. At this point, you have two options on how to proceed in order to get the bonus. Travel to the fort, found north of Anvil. Enter through the main entrance, and proceed cautiously, as Gerard Melie can be found patrolling the initial area. After eliminating or sneaking past him, you have two choices to proceed: the main gate or the side gates. The large portcullis gate is simply opened by a nearby lever while the side gates require picking two locks. However, by taking this route, you are more likely to avoid the mercenary patrolling around the bridge. Whichever method you choose, you'll be on the upper level of the next room, and can proceed easily to the medicine cabinet. If you speak with Teinaava before leaving, you can learn about a secret entrance to the south-southeast of the fort. The fort appears to have previously had an abbey - while it is now in ruins, you can enter through what remains of the tower, and easily pass into the fort through some half-flooded tunnels. As Teinaava claims, the tunnels are unguarded and provide easy access to the fort. Be wary, however, of Laenafil, who is found patrolling the area you surface into. Thanks to the darkness of the tunnels and a convenient alcove halfway, even players with a low sneak skill should be able to pass unobserved. The recommended option, somewhat counter-intuitively, is to kill Laenafil (who is unleveled and has extremely low health) and take her key, which opens the gates on the upper level; rather than taking the unlocked path to the lower level of the room, which leads right to Ulmug gro-Cromgog and Neesha. If you opt for the low path, you can wait until they have finished their conversation and follow them to Roderick's quarters, where you will have a greatly-increased chance of being detected as a result; or slip by them with even just a few seconds of invisibility, giving you several minutes to do your work in peace. This is the main benefit to killing Laenafil, since if you take the upper path their conversation will not start until you pass above them, again making it possible to pull off the switch with no-one around. Just be careful not to run into them on your way out. The medicine cabinet is located in a brightly lit area, and is best approached from the right. Open the cabinet and take the medicine, replacing it with your poison. Backtrack to the exterior using any of the above routes and taking care not be seen. Report back to Ocheeva to receive your reward. Return to Ocheeva for a level-dependent gold reward (up to 600 gold), a single Infamy point, and your bonus: The Deceiver's Finery, a leveled outfit that fortifies Speechcraft and Personality. This outfit is useful for the treasure hunt in the next Dark Brotherhood quest. Neither the poison nor the medicine are actual potions, so they cannot be consumed or applied to a weapon. They are found in your miscellaneous menu list. The poison is not a quest item, so take care not to lose it if you do not want to risk forfeiting the bonus. The only way to complete the quest after that is to kill Roderick yourself. If you wish to kill the guards without being detected, you can conjure creatures to fight them while you remain out of sight. 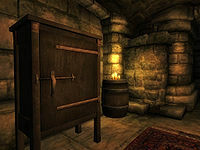 If you are caught by one of the mercenary guards, you will not complete the quest by placing the poison in the cabinet, but you can still complete the quest by killing Roderick yourself. After receiving the message that the bonus has been fulfilled, Roderick's Poison remains in the Medicine Cabinet and can be removed at any time. Upon entering the fort, you will overhear a conversation between Ulmug gro-Cromgog and Neesha about Roderick and his illness. Ulmug gro-Cromgog: "I just don't know. Is the medicine sustaining Roderick's life, or just postponing his death? How can he survive for so long with a fever so high?" Neesha: "Roderick's fever is in check, unlike your tongue! How can you think such things, after all he has done for us? For you? Have a little faith." Ulmug gro-Cromgog: "Faith? Are you telling me we're supposed to rely on the good graces of the Divines to keep Roderick alive? Even he would laugh at such nonsense!" Neesha: "Then what would you propose? What more can we do? That medicine is keeping Roderick alive. For now, that's the best we can hope for." Ulmug gro-Cromgog: "I know, Neesha. And I meant no disrespect. It's just that... I hate waiting around like this, watching him suffer!" Neesha: "As do we all, dear friend. Do not fear. I have been assured that the medicine will restore our Roderick to full health. But it will take some time." Ulmug gro-Cromgog: "Then let us trust a bit less to faith, and a bit more to our own strength. I shall guard the medicine cabinet myself. Just in case." Neesha: "And I shall continue my vigil at Roderick's side. It's just a matter of time before our leader returns to us. I can feel it in my heart." 10 I must sneak into Fort Sutch, find the medicine of the debilitated warlord Roderick, and replace it with the poisoned bottle Ocheeva has given me. If I am detected by any of the mercenaries, or if Roderick is killed in any other manner, my bonus is forfeit. 12 I must sneak into Fort Sutch, find the medicine of the debilitated warlord Roderick, and replace it with the poisoned bottle Ocheeva has given me. If I am detected by any of the mercenaries, or if Roderick is killed in any other manner, my bonus is forfeit. Fortunately, I've learned of an alternate way inside that should be unguarded. Not far from the ruins of Fort Sutch lie the ruins of the Fort Sutch Abbey. If I enter there, I can get to Fort Sutch underground through some flooded tunnels. 15 I have successfully entered Fort Sutch. I must now locate Roderick's medicine and replace it with the bottle of posioned [sic] medicine. 20 I have taken Rodericks' medicine. I must now put the bottle of poisoned medicine in its place. 30 The bottle of poisoned medicine has been placed in the cabinet, and the real medicine removed. The next time Roderick is given treatment, he will die. I must now return to the Sanctuary and speak with Ocheeva to receive my reward. 40 I have completed the contract, but not as directed, so the bonus is forfeit. I must now return to the Sanctuary and speak with Ocheeva to receive my reward. 100 Finishes quest I have spoken with Ocheeva and received my reward. It is possible to use the console to advance through the quest by entering setstage Dark07Medicine stage, where stage is the number of the stage you wish to complete. It is not possible to un-complete (i.e. go back) quest stages. See SetStage for more information. Prev: The Lonely Wanderer Up: Dark Brotherhood Next: Whodunit? Esta página foi modificada pela última vez à(s) 22h41min de 24 de janeiro de 2016.